Camp Nejeda is located on 72 acres in rural, beautiful Sussex County. The property offers plenty of opportunities for fun including basketball, archery, ‘beach’ volleyball, soccer, corn hole, paddleboats, fishing, and even zip lining across the camp’s seven-acre Saddlebag Lake. A one-mile walking trail winds through the camp to provide secluded views of the lake or bird-watching spots around the hayfield. Caspersen Dining Hall seats up to 160 people for three meals a day. All meal preparation and cooking takes place onsite in the camp's commercial kitchen. Meals are served family-style (each cabin's campers and counselors sit together) and carb counts are posted for every item served! The Helmsley Health Center opened in 2011 on the same site as the single-story health center it replaced. The new building is fully climate-controlled with two stories. The first floor includes two pump change rooms, an exam room, two sick rooms and appropriate storage for insulin and pump supplies. The second floor dormitory includes eight rooms, each with two sets of bunk beds, a small common area, and common bathrooms and showers. During the camp's summer residential sessions, the second floor houses the health center staff. During other camp programs such as BFF Weekend, Family Camp, and Survive & Thrive Adult T1D Bootcamp, the second floor dorm houses campers. 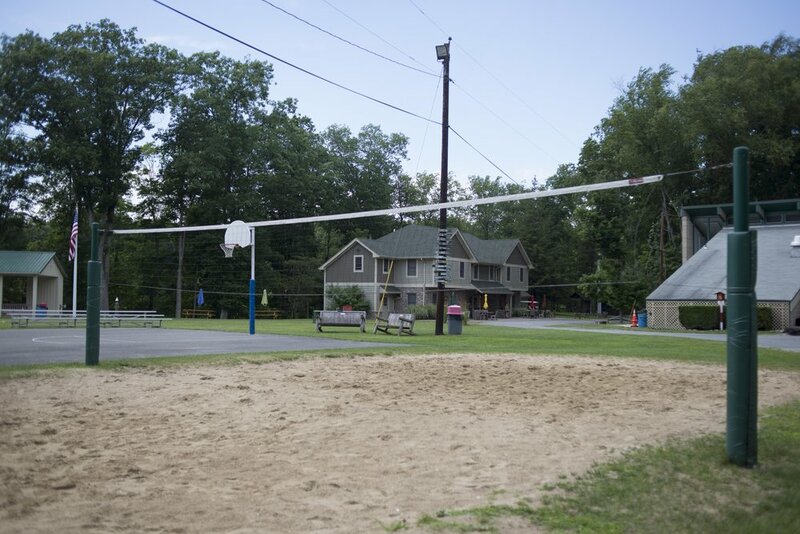 The soccer field is the "center square" at Camp Nejeda; along its perimeter are the Helmsley Health Center, Caspersen Dining Hall, the Shower Building, the Bolger Pavilion, the Girls' and Boys' Units (camper cabins), and the camp's pool. Campers and counselors use the field to play soccer, ultimate frisbee, and other team sports. Just next to the field is the camp's basketball court and beach volleyball pit. Todd's Trail winds for a full mile through Camp Nejeda's property. Those who walk, jog, or bike the trail are led through wooded areas of the camp's property, past Saddlebag Lake, and around an open hay field before circling back to the trailhead. Wildlife sightings might include turtles sunbathing on fallen logs in the lake or a Great Blue Heron taking flight. Todd's Trail includes a frisbee golf course and passes by the camp's low ropes course, tent platforms, archery range and Gaga pit, the Quiet Area gazebo, and the landing area for Hunter's Crossing, the camp's 650' zip line. The Bolger Pavilion is the meeting place for campers and staff before and after every meal. Each cabin sits together at their assigned picnic table so that their cabin nurse can review each camper's blood glucose and administer insulin. Large enough to seat the entire camp community, the pavilion is also where campers and staff meet for special presentations and speakers. Camper cabins are divided into the Girls Unit and Boys Unit. 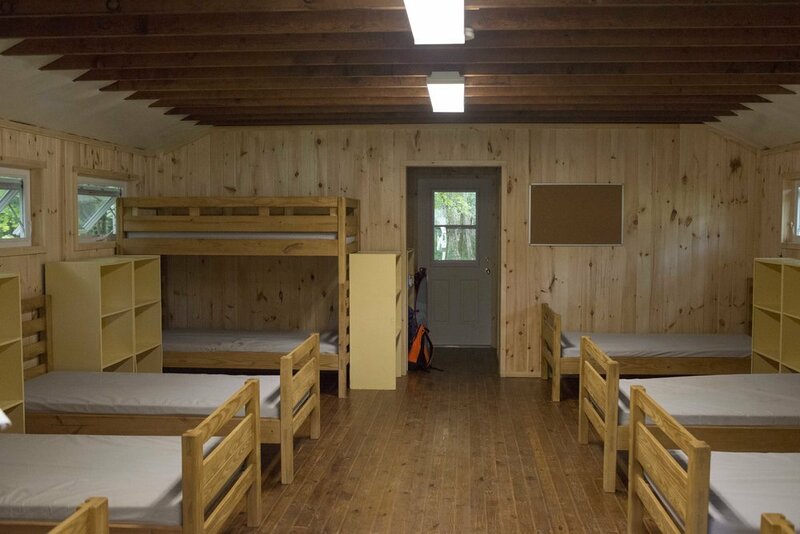 Newly renovated and insulated, each cabin accommodates eight campers and four counselors. A half bath is located in each cabin. Shower facilities are located in the new shower building. One of the first things visitors see at the top of the hill when driving into Camp Nejeda is the launch point for Hunter's Crossing. The 650' zip line stretches across Saddlebag Lake with zip liners landing on Todd's Trail. Zip line rides are a favorite activity at the camp and are applauded by fellow campers watching from paddle boats and canoes on the lake. The pool is large enough to accommodate the entire camp, which it often does on hot days! The pool is divided into two sections: shallow water ranging from 3-4 ft. and deep water from 5-9 ft. Campers have one hour of swim time every day during which they can have fun swimming with friends or play pool games such as water basketball. The playground is one of the campers' favorite spots to hang out between activities. Located right next to the pool, the playground includes a slide, small zip line, and monkey bars. In the middle of Todd's Trail, there is a small gazebo on top of a hill in the most peaceful place at camp. Called the Quiet Place camper and staff can visit to take a few moments to relax and enjoy the beauty of Camp Nejeda. The Archery Range is located along Todd's Trail where certified archery instructors provide lessons to campers. A large berm behind the range's four targets keeps errants arrows within the range and the range shed is fully stocked with archery supplies. Just outside the fenced-in area, the Gaga ball pit keeps campers busy and having fun while they wait at the range. Camp Nejeda's low ropes course includes 13 obstacles for campers to master, either individually or in groups, with the help of certified low ropes instructors. Guzy Cabin is home to arts and crafts activities at Camp Nejeda. Originally serving as the camp's dining hall, Guzy's porch and inside art room are now where campers come to craft. On the opposite side of the building, two small apartments house staff. Camp Nejeda's seven-acre Saddlebag Lake offers lots of fun activities including fun-yaks and kayaks, paddleboats, and fishing. The lake offers one of the best views of campers taking Hunter's Crossing across the lake; the 650' zip line stretches overhead, starting on one side of the lake and ending at the opposite side. Behind the shower building and down the hill, you will find the pole barn which offers a giant indoor space for use when the weather is bad. Campers play games like basketball, dodgeball, and scooters.